Sometimes things are not as they seem, and especially so in the natural world. Camouflage and mimicry abound in the insect world. For example, flies that look like bees, butterflies appearing as wasps, and caterpillars that resemble animal guano rely on these visual illusions to evade predators. On Aroidia, however, the swapping of roles in structure and function is for filling niches with abundant diversity, and not a necessity for survival. . . In some species of Acacia, the seedling leaves start out bipinnate, while subsequent leaves progressively convert to a simple flat sickle-shaped structure. 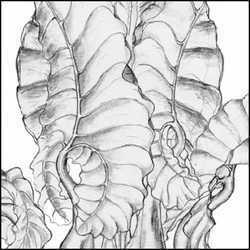 This flattened leaflike appendage that passes for a leaf is, instead, a modified leaf stalk called a phyllode. Leaves on other plants have been known to masquerade as flower petals, as in the Christmas Poinsettia. The bright red "petals" we all know and love are actually modified leaves called bracts. 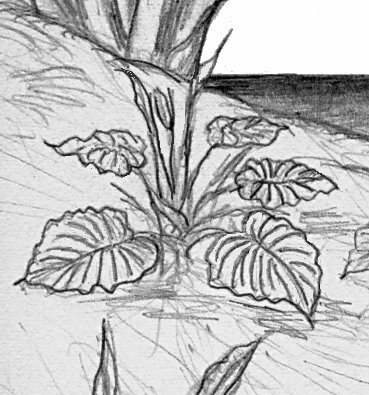 With this in mind, I was scarcely surprised when I envisioned my first species of the Aroidian genus Cryptophyllum (crypto = hidden; phyllum = leaf) and realized that the huge leaves I thought I saw before me were actually the spathes of inflorescences! The picture at right shows a portion of a specimen of C. minor; the five visible "leaves" are the spathes of inflorescences whose spadices resemble very large versions of cattail (Typha) inflorescences. All plants in this genus have leaves that are reduced to very small sheathing structures akin to cataphylls, while the spathes of each inflorescence assume the photosynthetic role of leaves. In a similar fashion as the Acacia mentioned above, the very young plants of Cryptophyllum start out with regular leaves resembling those of a species of Alocasia (see picture, below left). 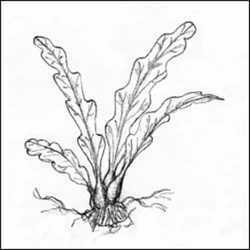 After producing no more than 10 of these gradually diminishing leaves, the plant begins producing sterile spadices with photosynthetic spathes. At this point the true leaves have reduced in size to a mere sheath with a tiny leaf blade at the end of it. 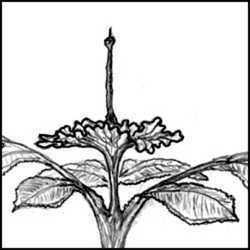 The plant must reach a mature size of 5 to 10 feet tall before beginning to produce fertile spadices. Two closely allied species of Cryptophyllum, C. major and C. minor, are usually seen in the same habitat and may, in fact, be two subspecies of a single species. They differ primarily in the overall mature size they achieve. C. minor rarely grows taller than 15 or 20 feet, while C. major can easily reach heights of 30 feet or more. They both possess creeping rhizomes that develop vertically rather than horizontally, unlike most rhizomes on Earth. The net result is that wherever these two Cryptophyllum types are found, they are always at, or very near, the top of small hills. These hills are formed by the plants themselves as a result of the continual growth of new root mass along the upwardly creeping rhizomes. As other plants gradually colonize the root mass, the hill grows ever larger. Hills with a fully matured C. major at the top can be substantial in height. A series of Cryptophyllum growing near each other will form a high ridgeline over the course of several Aroidian years. Cryptophyllum is one of the few genera of Aroidian flora that do not produce motile pollenoids. These plants rely entirely on the wind to disperse their pollen, in a manner very similar to many Earth plants. They do have explosive pollen capsules that respond to quick changes in ambient air pressure. This is advantageous for the plant, as these changes in air pressure are usually associated with the increasing wind activity accompanying the movement of weather fronts. Thus, a grove of Cryptophyllum at full male anthesis can become shrouded rapidly in a billowing fog of pollen right after a sudden drop in barometric pressure. Spadices at female anthesis have very sticky droplets on the broad tips of each pistilloid; these often become densely studded with wayward pollenoids from other Aroidian species, small bits of windborne debris and, of course, Cryptophyllum pollen! Berries and semmules of C. minor and C. major develop quickly after pollination, as this typically occurs very near the onset of the storm season. The berries are quite buoyant and can float great distances on the stormy Aroidian ocean. Once cast onto the shore of another archipelago, the post-storm warming sun melts the water-resistant coating, releasing a very sticky inner flesh. This serves to adhere the semmule firmly in place, allowing it to colonize the new territory successfully. Another plant in this genus bears very little resemblance to the ones described above. Cryptophyllum pseudo-trifoliatum grows as a tall, slender stalk topped by what appear to be trilobed leaves. 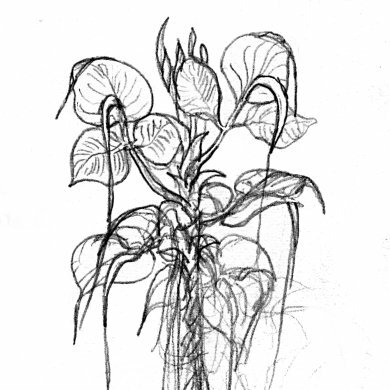 In this case, they are trilobed spathes together with an arching droopy spadix that identifies them conclusively as a member of the genus Cryptophyllum. The true leaves are very inconspicuous and nearly impossible to find, as they dry out soon after emergence. As is true for all species of Cryptophyllum, the spadices of C. pseudo-trifoliatum have a long, thin sterile appendage at their tips. Unlike C. major and C. minor, though, the growth of individuals or colonies of C. pseudo-trifoliatum does not result in the development of a hill. These plants are often found near the coastline, and frequently associated with specimens of Pinnatidendron. Their slender, very tough and resilient stalks stand in stark contrast to the massive heavily buttressed Pinnatidendron plants. Semmules are produced in gently explosive capsules that release their feather-studded kernels to the wind. The feathery appendages plus the explosive release insures their wide dispersal, although many of the semmules land in the ocean rather than on an archipelago. Such is the risk of relying on the wind for reproductive dissemination! After the last few visionary experiences, I was ready to discover some Aroidian flora that were familiar in terms of being more like Earth aroids. Finding them was as easy as an imaginative reconnoitering of the nearest biological archipelago. . .